Unlike many PF bloggers, I don’t meticulously document my spending, nor do I even have a proper budget. Since I started this blog around 6 months ago, payments for most of my investments and savings are automatically taken out of my bank account the day after I get paid. I then live on the rest. If there’s any cash left over after food, bills, expenses and entertainment have been accounted for, this will also go towards my investments and savings – this is when I see whether I hit my 50% savings rate or not! The last time I kept to a proper budget was when I was neck deep in credit card debt and was trying to pay it off….slowly. And it was slow – I had no MMM, no helpful PF and FI blogging community to help me out and keep me focused. I was distracted and didn’t see paying off the debt as a priority. As a result, I was carrying the debt for pretty much 15 years until I finally cleared it 5 years ago. I’ve thought about keeping a budget for this blog, as I see how it works so well for many bloggers, but I can’t bring myself to do it. I now realise that it’s because full-blown budgeting still gives me negative memories of when I was in debt, even though this time round, it will be for something positive, ie saving towards financial independence and early retirement! However, there is one thing I think I can budget for which doesn’t seem to give me negative vibes though – food (grocery) budgeting! For some reason, budgeting for my food shopping doesn’t remind me of the dark old days of debt but actually reminds me of my good old days as a university student, when I was balancing what I could spend on food with what I could spend on alcohol and going out! My student days still rank among the happiest of my life. I mentioned in No More Waffles’ blog that when I retire, I’d like to ‘live like a student’ again, ie be free to do what I wanted, with the world at my feet, only with a lot more money this time round and no living in mouldy student digs, haha! I only ever do one shop per week, visiting two supermarkets, Tesco and Aldi on the same day/ evening. If I run out of anything during the week, then I do without until it’s time to shop again. According to my credit card statements from earlier this year (not counting the time my family were over), I was spending on average £40 per week on groceries. That’s a lot for one person, especially as Laura at No More Spending spends only around £200 a month and she’s feeding a family! Although I guess alcohol probably pushed the costs of my shopping up. I’ve never been one to waste much of what I buy, I use the freezer a lot to manage my meals and dislike throwing away food – but spending £40 just shows that I’m obviously not shopping as smartly as I should. So what would be a good food/grocery budget? I thought I’d track my supermarket shopping in October, so that I could work out what an average weekly spend should be for me. I was also going to shop carefully, making a shopping list for what was needed each trip, cut down on the snacks and cut out the alcohol (I have my homebrew now of course!). My shopping will be for all my meals at home and the packed lunches I take to work, plus the usual household stuff. Wow, big drop from £40 as I didn’t just throw whatever in my shopping trolley! Of the £109.59, 25% was spent on meat or fish, while 20% was spent on fruit and veg, which doesn’t sound too bad, but maybe it should be the other way round. 16% was spent on dairy products but I still spent 11% on snacks – I think I can cut down here. October happened to be a month when I didn’t need to replace things like washing liquids, cleaning products etc so on those occasions, I’m likely to go over my average spend. In order to account for that, I think I’m going to try aim for a budget of £25 per week, or rather £100 over 4 weeks – see how that goes for a few months. All in all, a good exercise, one that I should have done a while ago – saved around £70-£80 this month compared to my usual shop according to my credit card statement. I found that shopping with a list meant that I spent less money as I only bought what I needed and I spent less time wandering up and down the aisles wondering what to buy. In theory, saving on my shopping should make it more feasible for me to get a 50% savings rate or more….let’s see if this actually happens! This entry was posted in Budget, Savings by weenie. Bookmark the permalink. Hi just caught up and read your whole blog, good interesting reading. I save a third of my salary each month limited mortgage your blog makes me think maybe dip my toe in investing, I am a bit risk averse though. what website company might give me a good beginners guide to the basics. You're doing excellent on food & grocery budget. That's very impressive! Keep it up. Hi Rob, thanks for stopping by and reading! Further down this post, there are lots of useful links but perhaps check out 'The Simplest Solution of All', which talks about the Vanguard Lifestrategy Funds which make investing really easy and can be for more risk-shy investors. To get more info, I just typed in 'beginner' in the google search box of Monevator's site and it brought up lots of other articles. Thanks – it's only the first time I've done this so it remains to be seen how I keep to it but I will definitely try! Thanks for stopping by! You made some interesting points about budgeting. It's funny but for me not making a budget reminds me of the bad old days of being in debt! 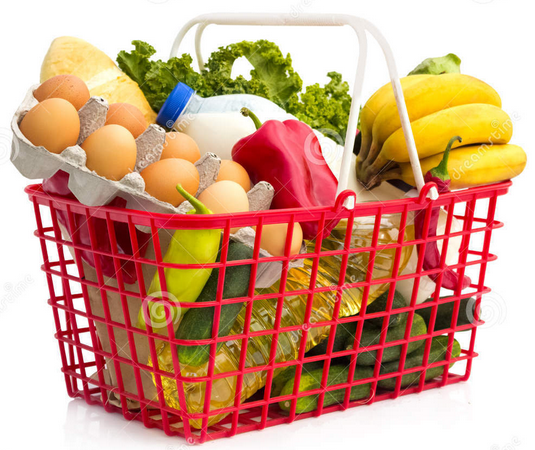 You did great on your grocery spending.Our grocery bill is the one line item that can blow our budget these days. I've been spending £250 ish for the last three months (for the two of us),but I'm trying hard to get it back to £200. I suppose if I didn't track it would be even higher! Thank you I will have a read. Hi Laura, funny how budgets mean different things to different people! Thanks and I know what you mean – it's so easy to go over the grocery budget when you're not paying attention. Tracking it has definitely brought it under control. Hi weenie. You (and most other FI bloggers if I'm honest) put me to shame as I know I don't put enough effort into budgeting. I worked out how much we need for retirement based on what we spend now but haven't thought too much about trying to reduce it so that we can get there sooner. However I have made a big effort to cut out waste and "silly" spending so I suppose that's a start. We put most of supermarket shopping on credit card so you've inspired me to keep a closer eye on the statements. Knowledge is power. 🙂 Hope you have a good weekend. Hi Cerridwen, the main thing is that you've taken that step to cut out waste so yes, that is a great start. I didn't think I was spending that much on my supermarket shopping until I saw what other people were spending, so I knew I could do better. Shopping with a list and planning at least some of my meals has really helped. Thanks, hope you have a good weekend too! Great control over your grocery spend! Miss Breakaway and I share a joint account and deposit a certain amount in every month to cover rent, bills and groceries. We try to drop the total deposit a little each month. The challenge is to ensure we cover all regular expenses in the initial deposit without having to add any more halfway through the month. Hi Joe, sounds like you've got things covered, what an interesting way of covering your regular expenses and ensuring that you are cutting down each month on your spending. Thanks for sharing and stopping by!